I would like to respectfully submit for your review Ken Amann for an EDGE&TA Hall of Fame Award. Ken was born in 1956 and spent his youth on the family farm in North Dakota. His family settled in Billings, Montana in 1966. He enjoyed many trips back to North Dakota to visit family there on the farm where his mom grew up. Ken Amann joined our EDGE&TA Branch 29 – South Central Montana Antique Tractor & Machinery Association in August 1996. His dad, Hugo, joined in October 1996 and passed away a few years later. 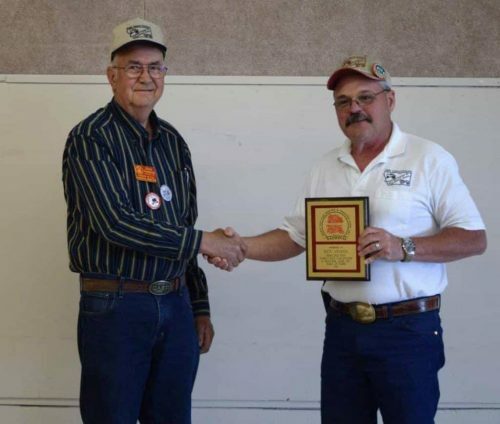 Ken has always had a passion and interest in antique machinery and has a full complement of restored tractors & equipment at his place in Billings, Montana. Ken served as secretary of Branch 29 from 2000 to 2004. In 2005, he was elected President of Branch 29 and has been our President ever since (12 years now). Every year elections come around and no one wants to run against him as he has done an outstanding job. Ken reads the highlights of the EDGE&TA quarterly newsletters at the branch meetings to ensure that we keep up with national events and shows. Ken encourages safety and participation in our branch. Our membership has now grown to over 200 families. Ken leads not only the monthly branch meetings but also schedules and attends the directors’ meetings in which we help plan the path forward for the branch and its membership. Ken also ensures we know what the other EDGE&TA branches are doing which has resulted in many of our members visiting other branches and shows throughout the year. The reciprocal effect is that other EDGE&TA branches visit us during our show (always the third weekend in August). Ken & his wife Paulette have traveled to other branch shows including the 2016 EDGE&TA NW Regional in Wyoming and 2014 EDGE&TA National Meeting in Lewistown, Montana. In 2012, Branch 29 was fortunate enough to host the EDGE&TA National show in which we featured IHC tractors & equipment. This took a lot of extra work and planning. Ken led the effort and encouraged us on to newer heights. As a result, the EDGE&TA National Show in 2012 was the biggest and most successful show we have ever hosted. It was Ken’s mission to ensure that we exceed EDGE&TA standards and expectations. Many fellow branches from surrounding states made the trip to our Threshing Bee that year and were not disappointed. In 2013, Branch 29 hosted the EDGE&TA NW Regional show and again Ken led the way. That year, we featured John Deere equipment and all of the “green” folks attended which was okay with the “red” IHC folks from the previous year as all had a good time. Ken is a warm, friendly person that enjoys visiting with members and visitors to our shows. His calm demeanor and receptive personality encourages even the most introvert of folks to open up and share their stories. He fields many calls during the year from interested visitors, the local press, and has appeared in a local TV video explaining our Threshing Bee. Each year during the show, Ken always takes a moment each day to walk around and ensure that everything is going smoothly and circulates through the crowd that attends. Ken has made a real difference, donated much of his time to the antique engine community, and has helped spread enthusiasm in our branch. His support of EDGE&TA helps to inform and tie us all closer to the national organization. He is a team player and encourages the interest in not only this old iron hobby, but in the friendship and growth of each club member and the comradery that we enjoy in our branch. 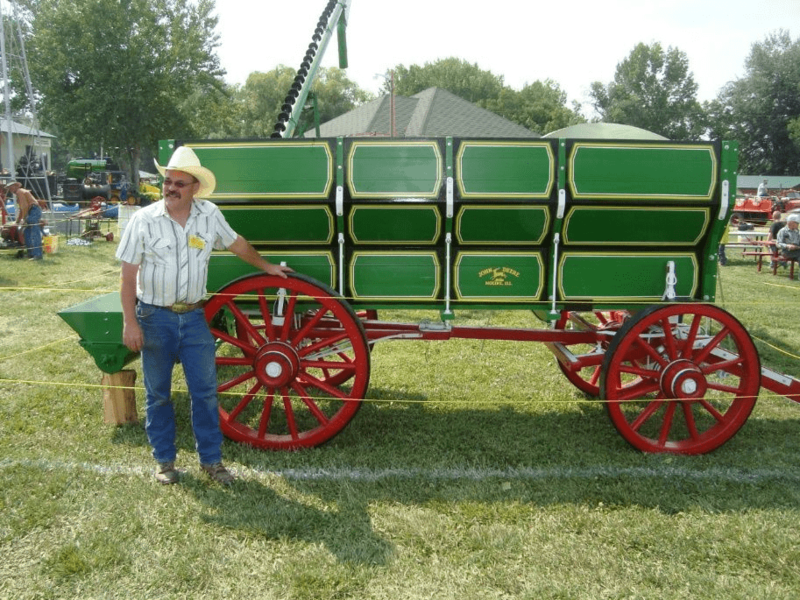 Ken took on a Branch 29 project to restore a wagon for the local Huntley Project Museum. The finished product was outstanding and the museum proudly displays the wagon year-round to visitors. Ken put many hours into this sole volunteer restoration. This is typical of Ken, working for the benefit of others even when no one is watching.